Okay. I really tried to avoid getting obsessed with Pinterest. At first I was like, how on earth can someone spends hours looking at pictures? And then, I fell into their trap made my own Pinterest account. I would spend a few minutes here and there looking at the Food & Drink section, and sometimes the Fitness section. I didn't get what all the hype was about, but now, I'm hooked. I'm not even the type of person who likes to spend hours online on sites, such as Facebook, but Pinterest is like a whole different story. Is anyone else obsessed?!? ANYWAYS, I saw this recipe on Pinterest about a thousand times, no joke, and had to try it myself. The original recipe used Dannon's honey yogurt, but I didn't want any added sugar in my version so I used plain, nonfat Greek yogurt and added my own sugar-free/calorie-free sweetener. They were amazing! The only problem was that I left the blueberries in the freezer for too long and my freezer feels like it's 5x colder than a normal human being's freezer (I should probably raise the temperature setting.....), so I had to refrigerate them for a whole day until they were edible, aka, not like balls of ice. 1. Line a cookie sheet with a silpat and reserve space in your freezer for the pan, set aside. 2. In a small bowl, add the yogurt and stir in the stevia, honey/agave if you choose. 3. 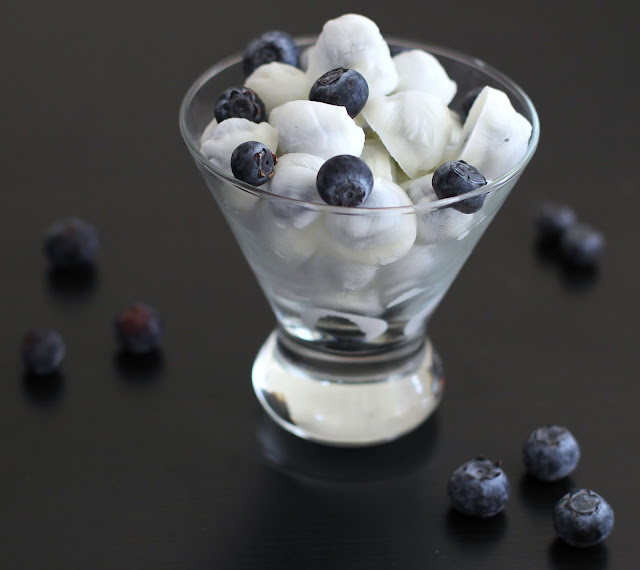 Poke a blueberry with a toothpick, dip in the yogurt, and push the berry off the toothpick with another toothpick. Do this with all of the blueberries, and put the pan in the freezer for 1-2 hours, or until frozen. Put the blueberries into a sandwich bag and store in the fridge or freezer. While these were great, I preferred some more flavor. Like I said in the recipe note above, my blueberries weren't very sweet and didn't provide as much flavor as I had hoped. Soooo, I added some of my favorite "treat" to the yogurt mix. Can you guess what I used? It may sound gross, but I added lemon-flavored fish oil to the yogurt! Before Barlean's, I absolutely hated fish oil. The pills were too big and had a terrible aftertaste for hours after swallowing them. Barlean's isn't fishy at all and the blueberry-lemon combo was great. It tasted more like lemon sherbet than a healthy snack! 2. In a small bowl, stir together the yogurt and fish oil. Just followed you on Pinterest :-) these look good! i'm also wondering the same thing as the previous comment re vegan yogurt and am wondering whether a thick cashew cream will work as i often make my own 'yoghurt' by blending up cashews with water that way since you can make it as thick or runny as you like. Yummmm that sounds great! I would try that if I wasn't allergic to cashews, but I'm sure cashew cream would work. You may want to add a little bit of agave and/or coconut oil (as I've seen in those raw cheesecake recipes) to help bind it or add some creaminess. Hopefully that works! Oh, I love this! What a great idea! Definitely going to give these a try! I love your addition of the lemon flavored fish oil, I'm going to have to track that down, it sounds like a YUMMY combo! These sound like such a refreshing treat! And I was hesitant about Pinterest at first, but I can't stop "pinning" now! It looks really yummy! You could almost feel how cold the yogurt is. Not bad! Fish oils do have several health benefits. One of which is the Omega 3 fatty acids which helps prevent arthritis and depression. could you use bananas or other fruits for this? Yes! Bananas, strawberries, grapes, peaches etc can work. I am really craving for this. I think Im'ma rush int he stores now... LOL. thanks for this great one.